Unofficially, Bellbrook starting pitcher Jayden Elliott limited Franklin to three hits over seven innings of work. 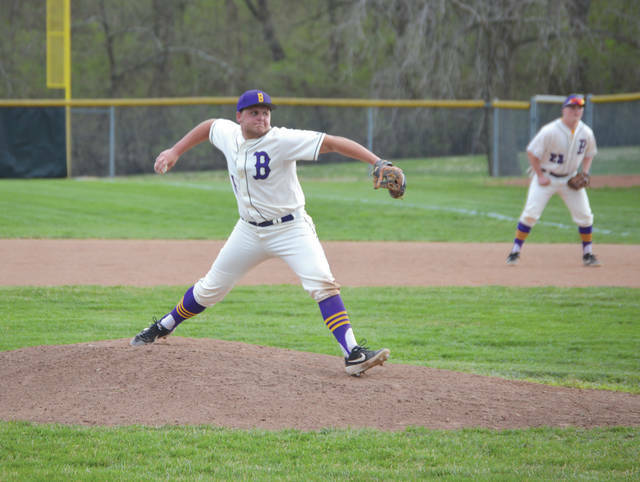 Officially, Elliott was dominant on the mound in Bellbrook’s 4-0 win April 10 at Bellbrook High School. Franklin starting pitcher Clayton Black throws a strike across Ben Borszcz’s knees early on in Wednesday’s Southwestern Buckeye League matchup at Bellbrook High School. Bellbrook’s Jayden Elliott beats the throw to Franklin third baseman Drew Gescuk, during the sixth inning of an April 10 high school baseball game at Bellbrook High. 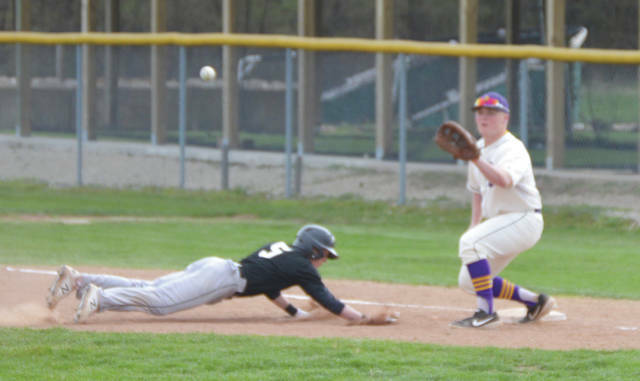 Bellbrook first baseman Jake Todd readies to make the catch on a pick-off attempt of Franklin base runner Aiden Kinser, April 10 at Bellbrook High. Kinser was safe on the play. 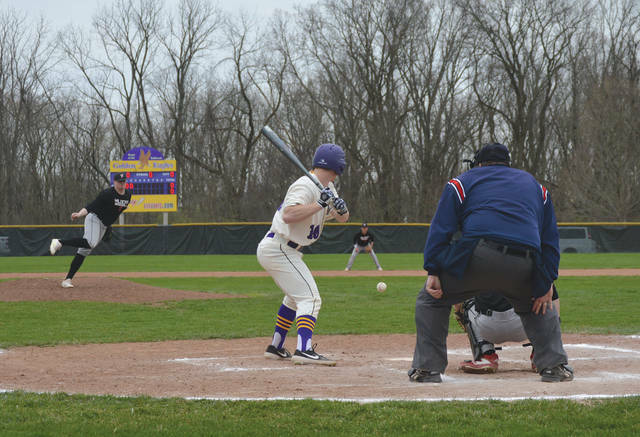 BELLBROOK — In one of those pitchers duels that all batters hate, Bellbrook’s Jayden Elliott and Franklin’s Clayton Black were definitely in one on Wednesday, April 10 in a Southwestern Buckeye League battle at Bellbrook High. 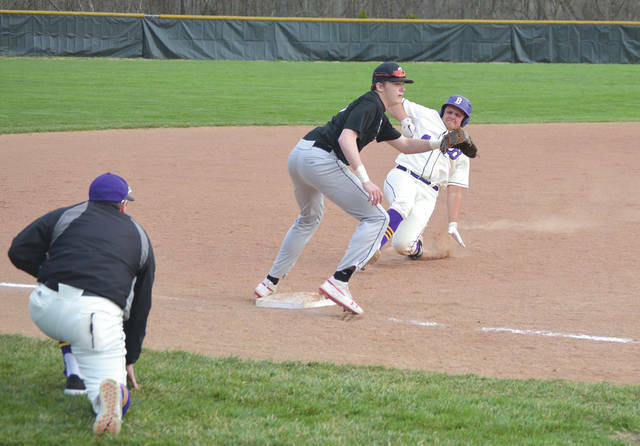 Control issues ultimately decided the tight contest in the sixth as host Bellbrook drew three walks and had a pair of hits and a pair of hit batsmen in the sixth in what turned out to be a 4-0 Golden Eagles win. The two righthanders had stymied their opposing team’s batters through much of the battle. Elliott had limited Franklin to three hits for the game and had unofficially recorded six strikeouts over the final five innings of play; Black had held Bellbrook to a pair of hits, with six K’s of his own, until the four-run sixth. Bellbrook initially threatened to score in the fourth inning when Adam Galle laced a one-out double into center field. But Black responded by getting the next Bellbrook batter to flyout to shortstop. The next Golden Eagle then flew out to center to end the threat. Franklin advanced Black to third base in the fourth inning, but couldn’t bring him home. The Wildcats then threatened again in the sixth when Aiden Kinser was hit by a pitch, advanced to second on an infield groundout, then stole third. After Elliott gave up a walk to Black, he then got the next Wildcat batter to hit a lazy fly ball to right field for the final out. Coach Venters has 10 senior players on his roster, and that veteran savvy paid dividends in the crucial sixth inning. With one out, Elliott started things off with a single to left field. He then advanced to second on Galle’s hit to centerfield, then the two base runners moved up a base on a passed ball. Jake Todd then drew a walk to load the bases with Eagles. Ben Borszcz was then hit with a pitch to enable Elliott to trot home with the game’s first run. Ethan Fryman then drew a walk to bring home Galle, Nolan Sizemore was then hit by another errant pitch to score Todd, then Caleb Fugate drew a walk to score Borszcz. Franklin coach Kyle Wainscott had no qualms about having Black on the mound. “Clayton was rolling there for us. That’s our horse. We have a 1A and a 1B pitcher on our staff. We threw our 1B on Monday (in an 8-2 home win over Bellbrook), so he was our guy,” Wainscott said. “For most of the game, he was in control of the game, so we were gonna ride with him. Franklin stays atop the Southwestern Buckeye League’s Southwestern division standings at 8-3 overall, 5-3 in the division. The ‘Cats are scheduled for a non-league road contest with Miamisburg for their next game at 5 p.m. April 11. Bellbrook (5-5 overall, 2-1 SWBL Southwestern) has a non-league battle at Wayne set for 5 p.m., on Thursday, April 11. They’ll then get back into divisional action on Friday when they’ll host a 5 p.m. contest with Monroe.